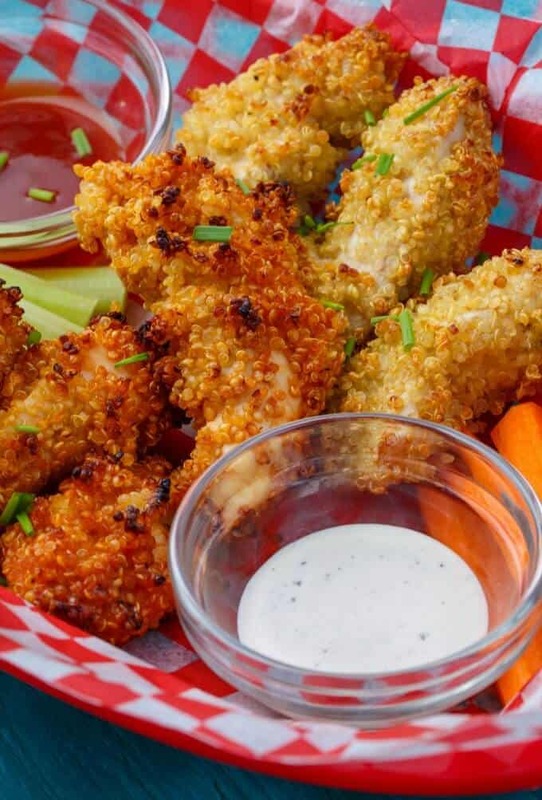 A twist on the childhood classic, these quinoa-crusted chicken nuggets are gluten-free and require no breadcrumbs! 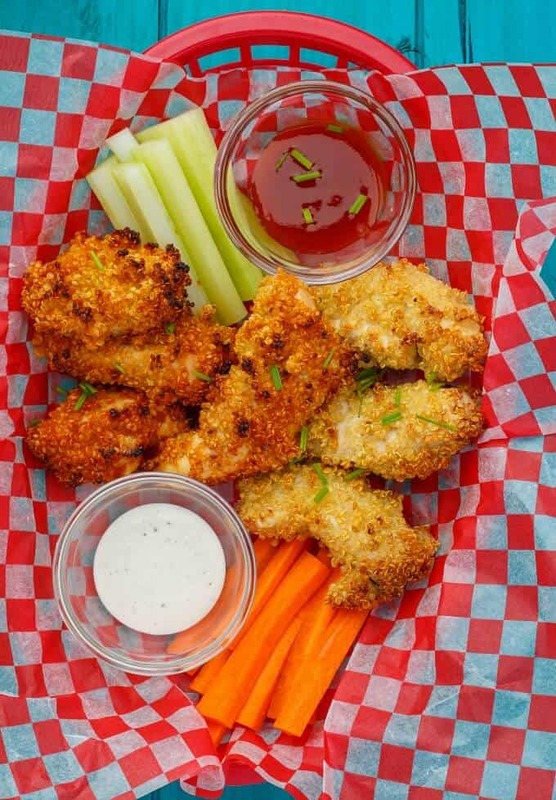 Use your favourite sauce to create this awesome snack, lunch, or dinner! I’m going to state right off the bat that these quinoa-crusted chicken nuggets are inspired from my quinoa crusted tofu nuggets! That post has seen much success and popularity, and when I had originally created it I knew I wanted to recreate it with chicken (because let’s be honest, chicken is more appealing to kids most of the time.) My daughter loves tofu and chicken, but quinoa is not her thing… But my husband was all over these nuggets! Simple, customized to your liking (choosing which sauce you want to use,) and great for a gluten-free diet! The two sauces I went with this time around were BBQ sauce and Ranch. But any thicker sauce will do! Season you meat with salt and pepper, roll in the sauce, and coat in the cooked quinoa. You will be surprised how well the quinoa sticks. I always tend to cook my meat at higher temperatures to begin with, and in this case it really helps get that crispy quinoa-texture going on. 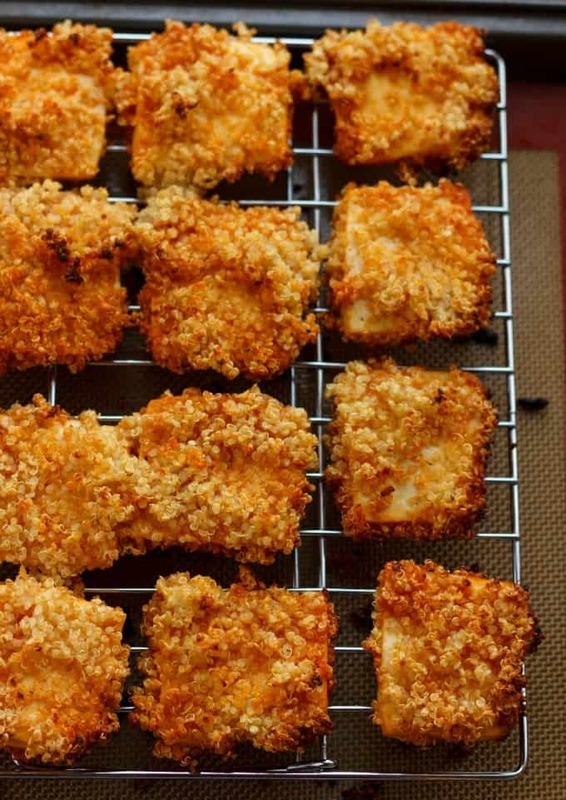 Feel free to broil the quinoa-crusted chicken nuggets in the end for even more crispiness! I know my recipes are not crazy healthy or fitness-related, however I do enjoy seeing my family eat healthy and feel the recipes we do eat are what other families would eat. Of course I don’t post every recipe we eat to the blog, so I guess that can be kind of deceiving. Some are easy, some are difficult, but in the end we eat what we like and that’s that 🙂 So enjoy these quinoa-crusted chicken nuggets and let me know what your favourite sauce is to use! Add quinoa and water to a medium-sized saucepan over high heat. Bring to a boil, reduce to a simmer, cover, and cook for 10 to 15 minutes, or until no water remains. Preheat oven to 425F. Line a baking sheet with silicone liner or parchment paper. Season nuggets with salt and pepper. Pour sauce into a bowl and add quinoa to another. 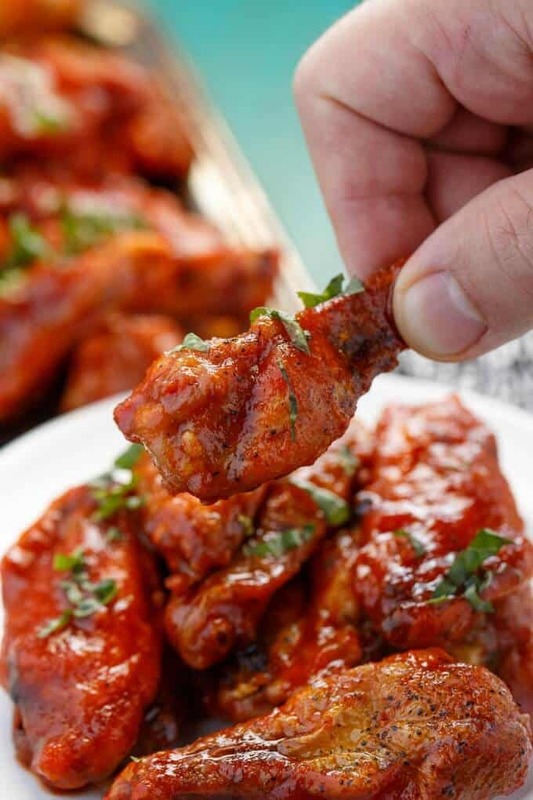 Dip one strip of chicken at a time into the sauce until coated. Move to quinoa bowl and toss around until fully covered. Place onto baking sheet and continue until no chicken remains. Bake for 20-25 minutes, or until internal temperature reaches 160F. This meal is a great way to use up leftover quinoa! Broil your chicken in the final few minutes for an extra-crispy crust!